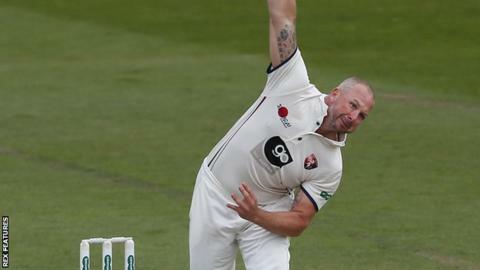 Kent earned a third straight Division Two win as they finished off Derbyshire with a day to spare at Canterbury, despite Gary Wilson's valiant 97. Resuming with a 242-run lead on 142-7, Kent made 308 as Darren Stevens hit 90 and Adam Rouse made an unbeaten 95. Needing 409 to win, Derbyshire lost their first five wickets for just 78. With Stevens (3-63) and James Harris (4-56) in form, and only Wayne Madsen (32) and Wilson managing more than 17 for Derbyshire, Kent made victory safe. Wilson did his best to take the match to a fourth day before falling to Harris lbw just three runs short of a century. Earlier on day three, Kent wicketkeeper Rouse went close to his first-ever senior ton, but ran out of partners as Will Davis (3-48) bowled well for the visitors.